i have yet to brave the dmv and make it official. lately i have been hoarding my time off and refusing to do anything but fun-filled things. this, of course, has led to a house that is still packed to the brim with boxes and an ever-growing to-do list. thus, in addition to the cliche need-to-get-in-shape-and-be-less-of-a-jerk resolutions, this year i shall also be vowing to get the ol' adult responsibility thing going, too. to be fair, there has still been a lot going on. the move was a bit of a disaster. despite the monstrous truck that we rented, we still couldn't fit everything and ended up leaving our elliptical. even though rationally i know that we used that machine for maybe a total of 5 hours, it still felt wasteful. that thing was expensive after all. i desperately posted it to craigslist as a last-ditch effort to recoup funds, but didn't have any bites in the 48 window i had idiotically allotted. sigh. my mom also managed to get herself, the cat, and the dog safely back to home state via ridiculously long road trip. needless to say, by the time we arrived back at the house we had recently purchased (!!!) we were all a little too tired to care about much. both sides of the move had problems (damaged furniture, recalcitrant moving crews, etc) - but we made it. in fact, we recently moved in all of the stuff from my mom's storage unit, too. can you believe it? for the first time in SIX YEARS, we are not paying for a storage unit. hallelujah. so now we "just" have to figure out the logistics of this new house of ours. 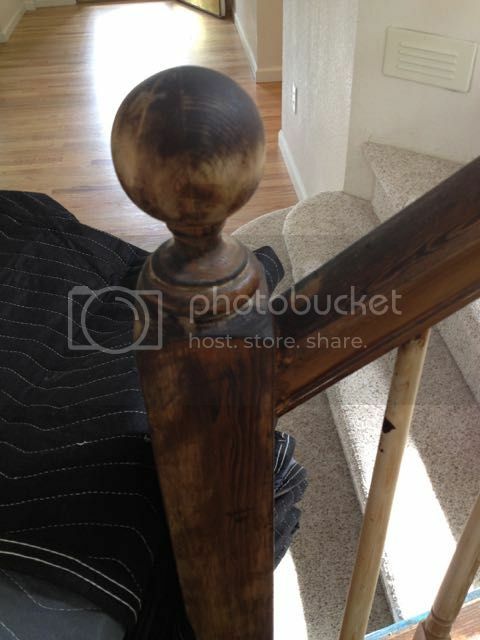 i have already had what can only be called a pinterest fail wherein i stupidly believed the world of DIY bloggers and attempted to stain my oak-colored banister a nice espresso color. ended up with a blotchy mess (even after spending 3 solid days sanding and ending up with blisters on every. single. finger). we are planning on painting it now. fun! this, and a series of other maybe-pinterest-fails-but-hopefully-fun-experiences will most assuredly be happening over the next few months. but in the meantime? we just get to be. Those pinterest and DIY mom bloggers are LIARS! But I'm sure the banister will look lovely when painted :) Congrats on finally getting to your new home, and take your time settling in. Miss you.